Are we REALLY Ever Ready to Give Up What Annoys Us? 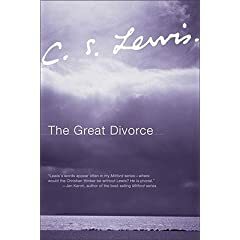 I’ve been on a reading frenzy since New Years and one of the books I devoured was a book I read 16 years ago, a little known fiction book from CS Lewis called THE GREAT DIVORCE. This book tells a tale of ghosts who venture out on a field trip which offers them a choice of heaven or hell…all they have to do is choose…and give up what annoys them anyway. Will they choose heaven or hell? I got so many new things out of it this time around and saw so many things in ME that needed reflection, pondering and yes, giving up. The Great Divorce is a quick, easy read with great rewards. Here’s my take on it http://hhvx.com/CSLewis. I heard my friend Ken Wales is exploring making a movie out of it…ooh that would be so cool. Hope it happens and wouldn’t it be perfect to have Anthony Hopkins in the CS Lewis role again.